“Religion is the opium of the masses” is a famous Marx-ism. 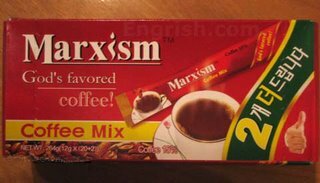 Now it seems that Marxism itself has turned into a stimulant. And even God likes it. Gone are the days when it sparked off a struggle. The revolution! Now in a full-bodied flavour! And the next time you stop off at a chai kada in Commie Kerala (God’s own Country? ), you might suddenly be asked to take a big invigorating sip of Marxism. I suppose, when they meant Marxism, they did not mean this. And in other news, seems like the guy in the old Moods condom ad where he hesitates to ask the shop owner for a condom need not hesitate or feel shy any longer. All he has to do now is stride confidently up to the counter, and ask for a bottle of Pepsi. Where did you dig that up?